The city of Cairo lies on the Nile river in northern Egypt. 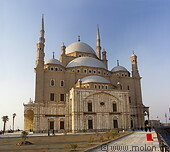 With 6.8 million inhabitants Cairo is the largest city of Egypt and its capital. Cairo's history dates back to 2200 BC, when Memphis, the capital of Lower Egypt, was founded there. Due to its strategic location just upstream from the Nile delta, the area continued to play a key role over the centuries. Present day Cairo dates back to the 10th century. Near Cairo are the famous pyramids of Giza and Saqqara and in the city itself there is the Egyptian National Museum, full of archaeological artifacts. Cairo suffers from high levels of pollution and traffic. 3 panorama views of Cairo. 29 photos of Islamic Cairo, a huge area with over 800 listed monuments, many dating back to medieval times. 21 photos of the area around Midan Tahrir and Midan Talaat Harb squares. 11 photos of the Ar Rifai, Sultan Hassan and Ibn Tulun mosques.